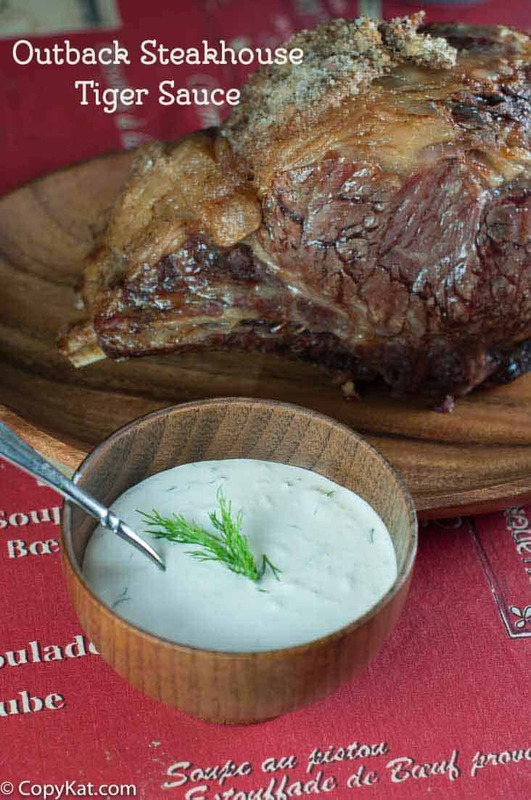 The Outback Steakhouse Tiger Sauce is an amazing sauce to serve with your next roast beef. This creamy, slightly hot sauce goes so well with roasted meats. Whenever I make a prime rib roast, I think of making some of the Outback Steakhouse Tiger Sauce. It is so easy to make, and it adds the right touch to many types of meat. I like to serve this with corned beef, roast beef, or I have even put this on a sandwich before. The Outback Steakhouse menu has so many different recipes that I love to make. This recipe is simply sour cream, horseradish, and some dill weed. You can find prepared horseradish most often the dairy section of the grocery store. The horseradish is already peeled and grated for you. I like to make this up a day or two before I am going to use this. Early preparation gives the sauce’s flavors a chance to mix. You can serve this famous Tiger Sauce with your next roast beef. Be sure to check out these other Outback Steakhouse Recipes. A roasts never had a better sauce! In a small bowl combine all ingredients and mix well. Store in an air tight container for at least 4 hours before serving. Ideally allow the flavors to mix together for a day or two before serving. Just my 2 cents on this one, I have found that kosher prepared horseradish, is a little better in this than the Boars Head varieties in this. Also use fresh dill if available, if not take the dried and heat it up BRIEFLY in a pan so it starts to release the oils. I have been addicted to this for 20 years now and add it to most every steak dish I make. I will have to give this a try, I have never done this before. Good tip, the dill (Idid parsley too) tastes great.